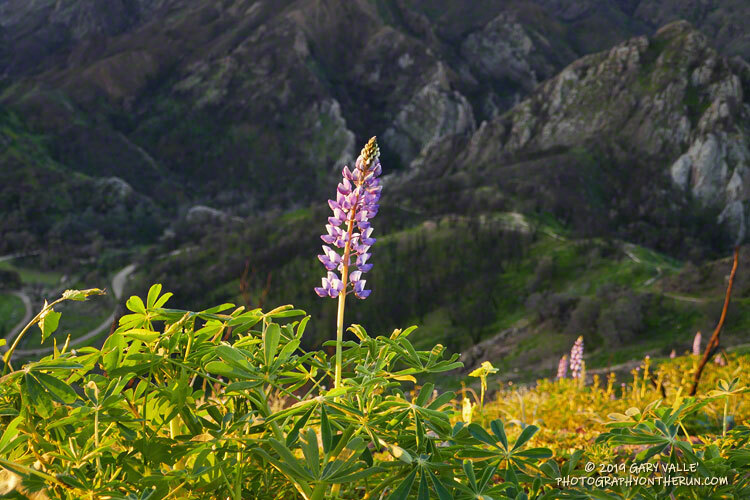 Lupine along the Cistern Trail illuminated by the rising sun. 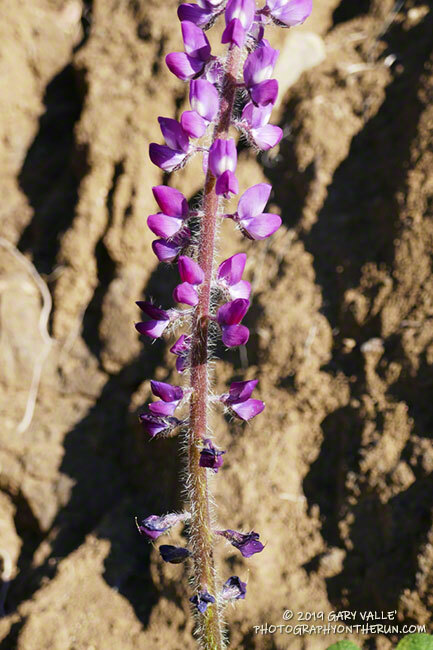 Lupine is a hardy plant that can grow and flower in areas overrun by introduced grasses and other plants. 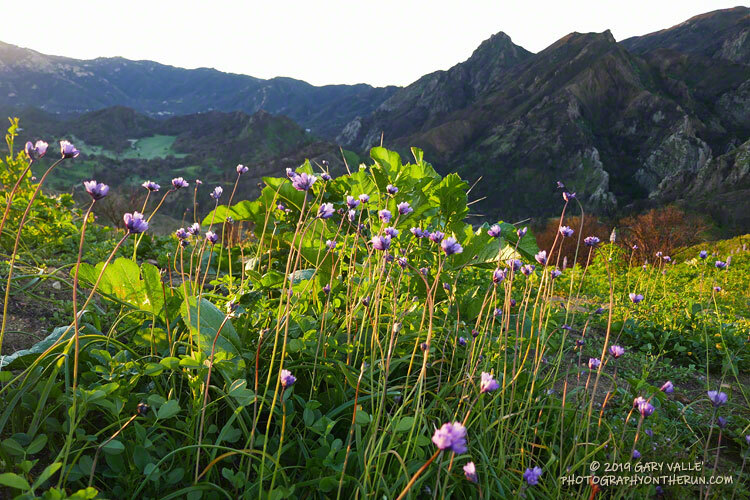 Blue dicks (Dichelostemma capitatum) are widespread in wet rain years. 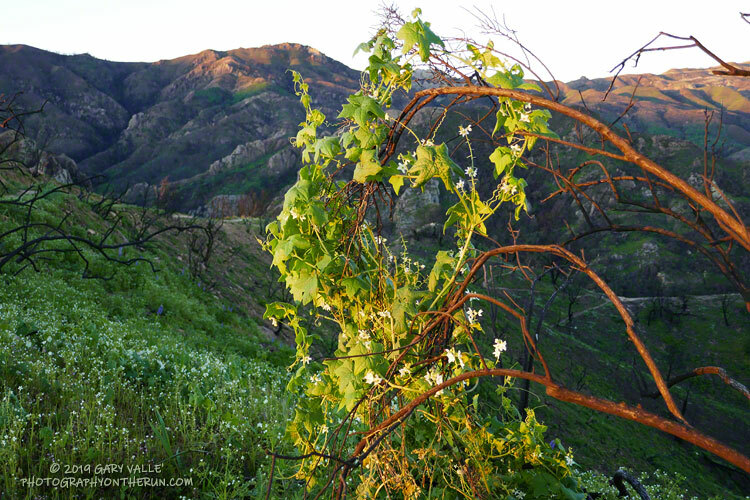 Wild cucumber draped on burned limbs of chaparral. 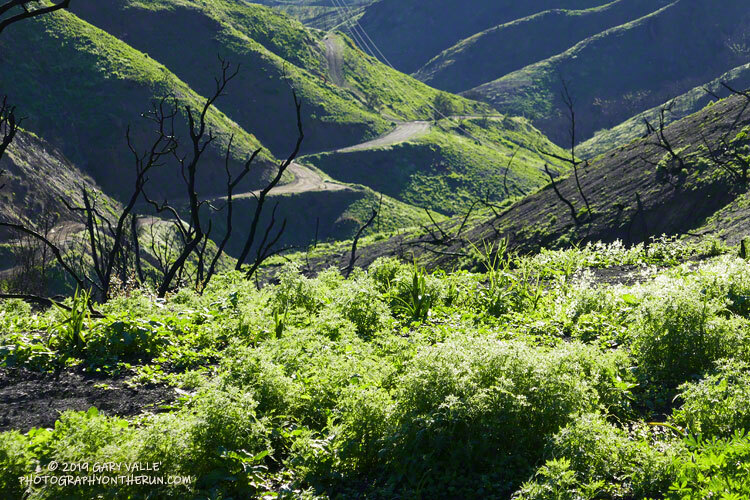 It's hard to tell if wild cucumber is more extensive following a fire, or just easier to see. 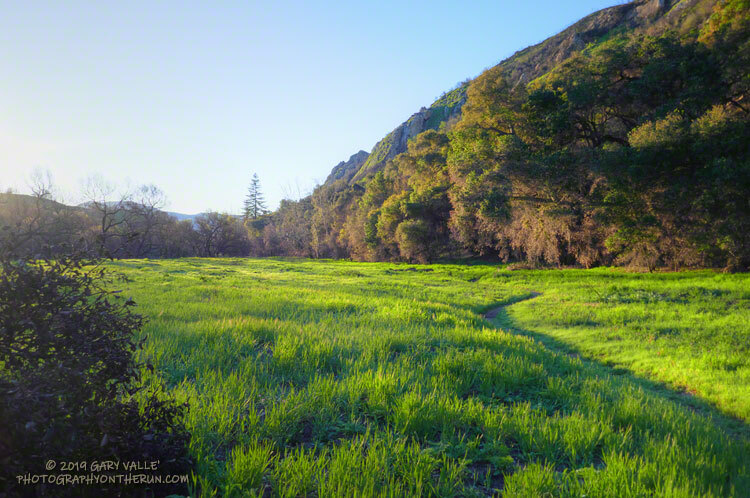 Early morning on the Forest Trail in Malibu Creek State Park. The conifer left of center in the background is a coast redwood. 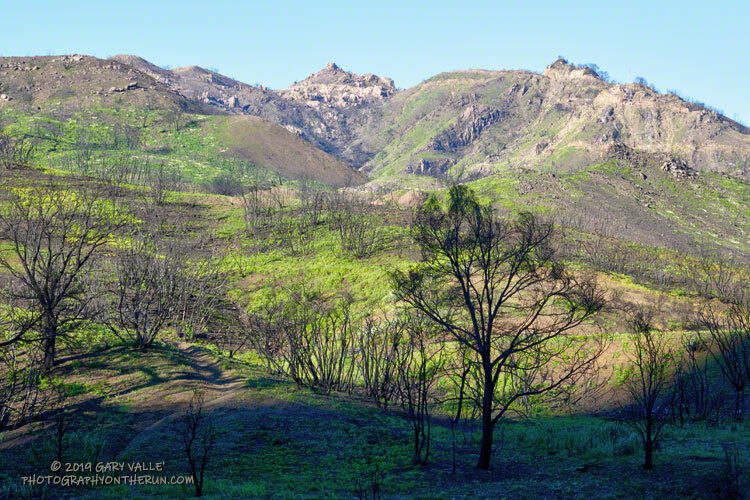 The mature coast redwoods that were not killed or severely impacted by the drought, appear to have come through the Woolsey Fire OK. WIth all the rain, I expect to see new growth on the surviving trees in the coming months. March 16, 2019. 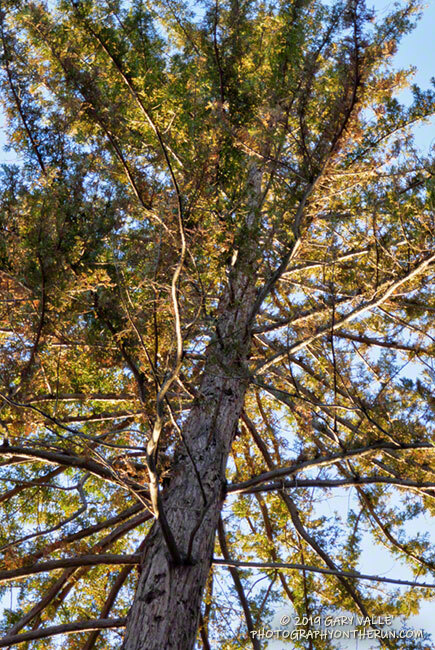 It's a little too early to know if this young, naturally-occurring coast redwood was killed in the fire. 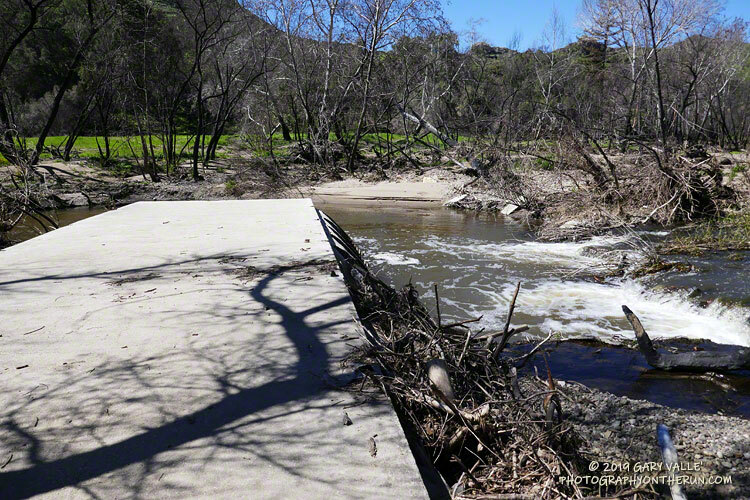 High water on Malibu Creek overran and then bypassed the footbridge on Crags Road near its junction with the Forest Trail. March 16, 2019. 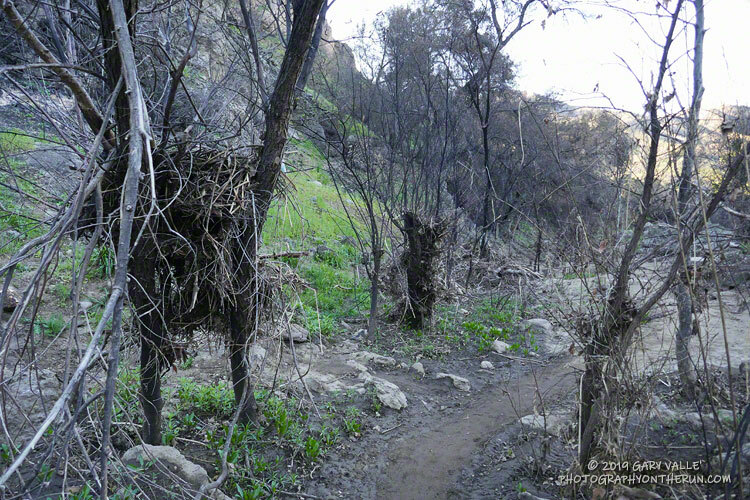 Where the trail used to be! 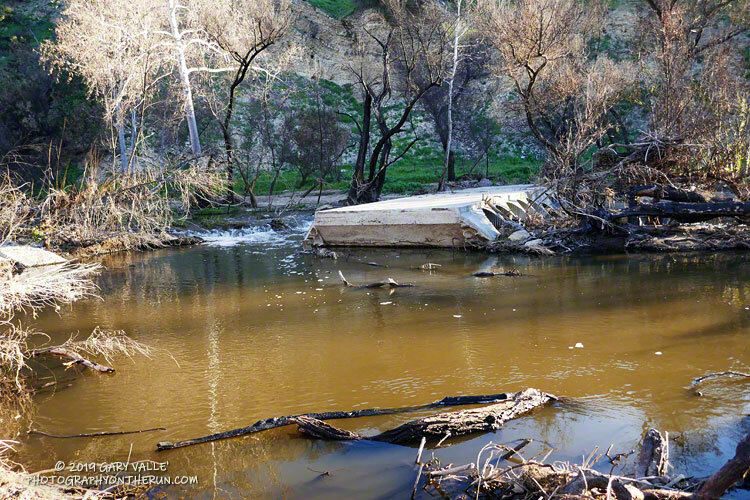 A downed tree upstream of the footbridge is being used to cross the creek. March 16, 2019. 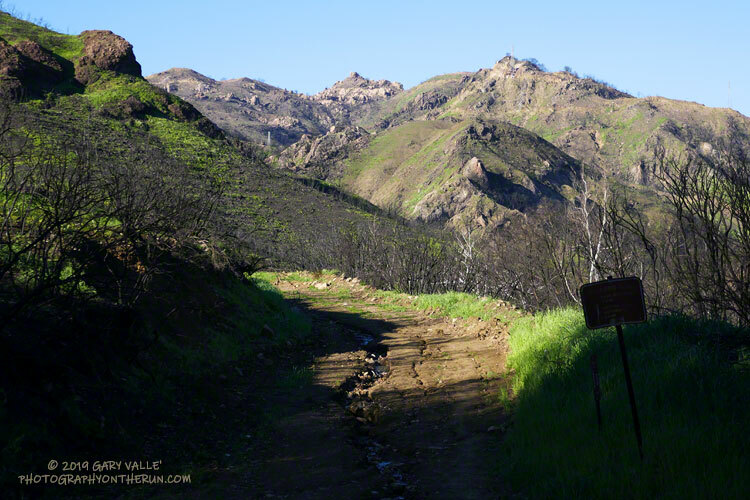 View of the footbridge on Crags Road from the Forest Trail-side of Malibu Creek. March 16, 2019. 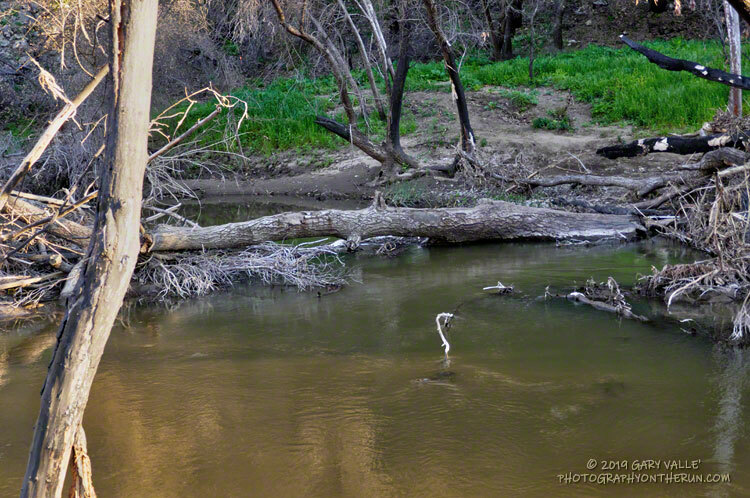 Handy tree across Malibu Creek upstream of the circumvented footbridge on Crags Road near the Forest Trail. March 16, 2019. 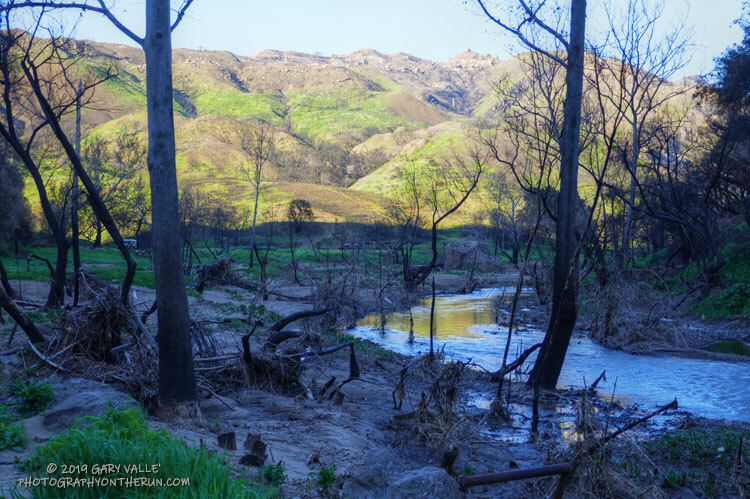 Flood debris along Malibu Creek on the trail to the M*A*S*H site. 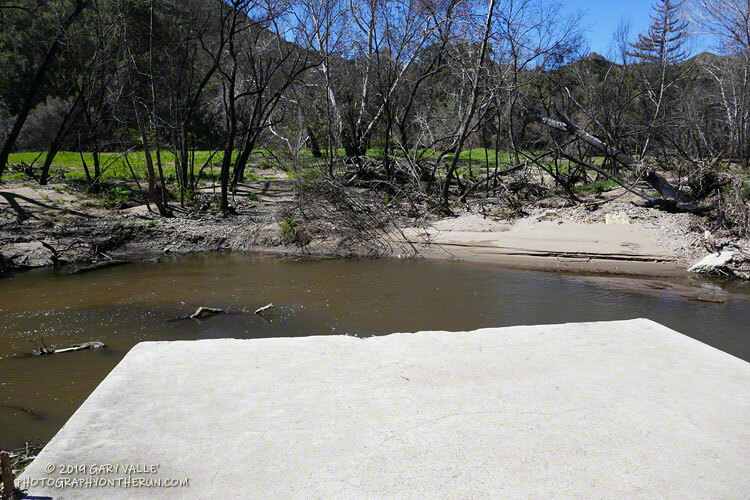 A broad section of Malibu Creek downstream of the M*A*S*H site. March 16, 2019. 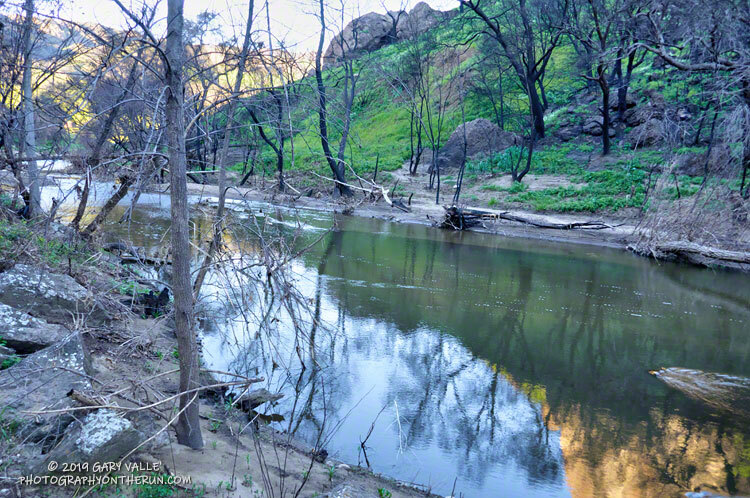 Malibu Creek near the M*A*S*H site. The Bulldog climb is on the right of the mountains in the background. March 16, 2019. 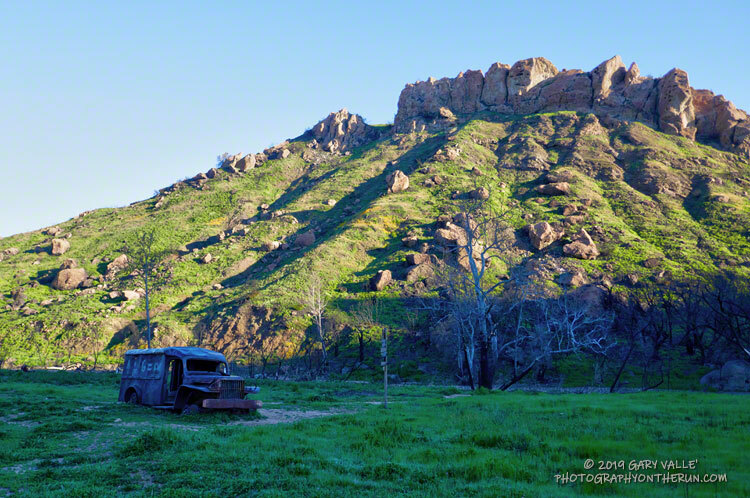 Looking up at the Bulldog Mtwy from the M*A*S*H site. 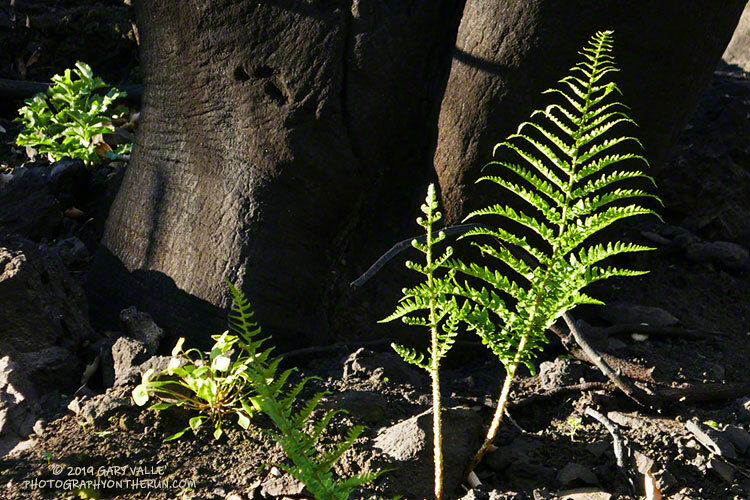 March 16, 2019..
Unfurling wood fern near the M*A*S*H site. The start of the Bulldog climb. Milkmaids along Bulldog Mtwy. March 16, 2019. 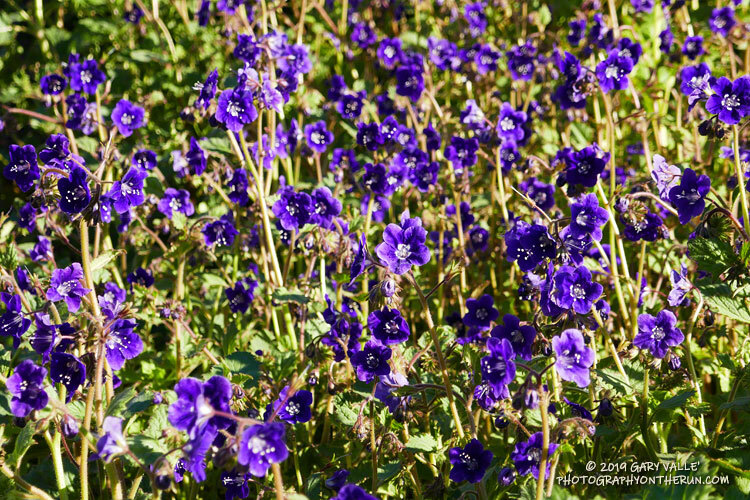 Parry's Phacelia along Bulldog Mtwy. March 16, 2019. 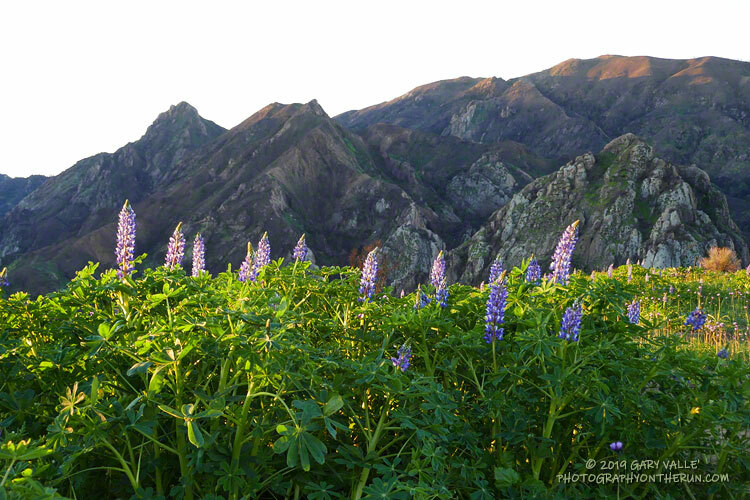 Stinging lupine along Bulldog Mtwy. March 16, 2019. 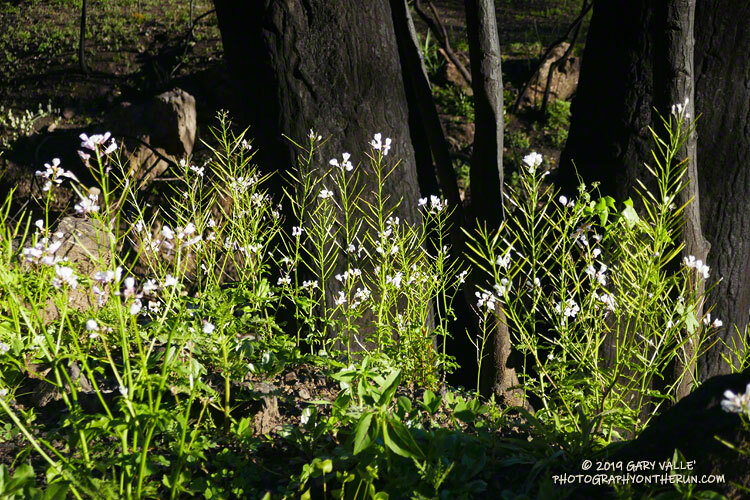 New growth along Bulldog Mtwy. March 16, 2019. 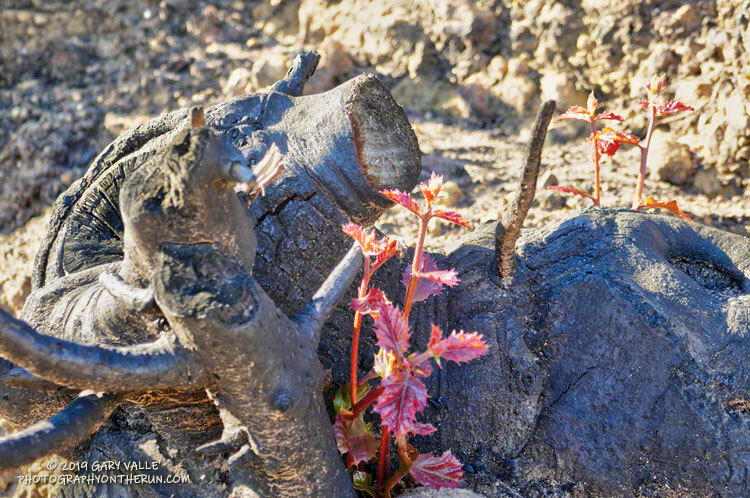 Don't assume a burned tree is dead. 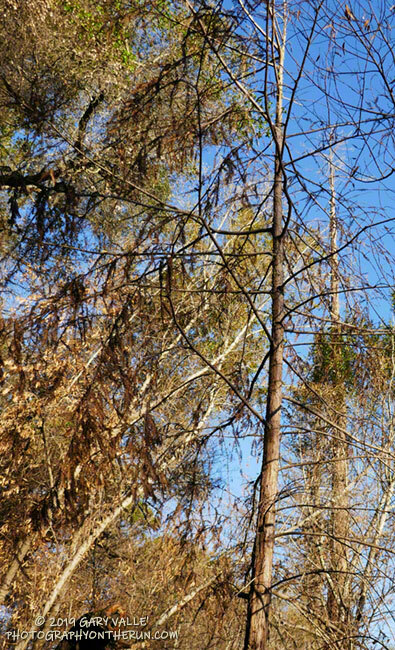 Coast live oaks are extremely resilient. 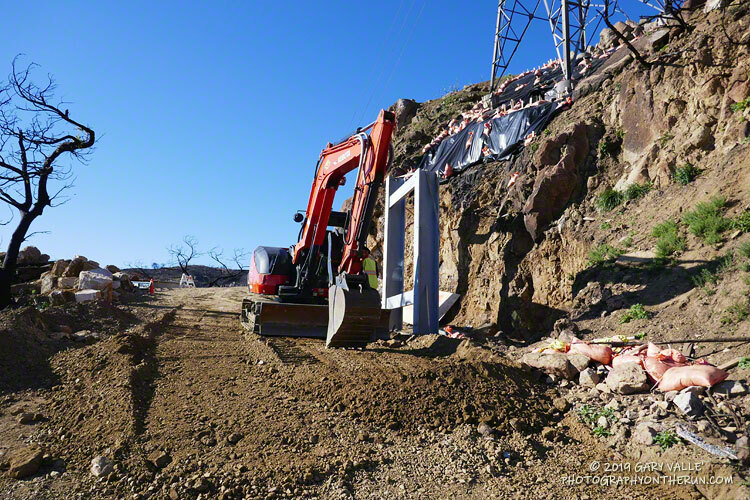 Repair work to stabilize the footing of a power transmission tower on Bulldog Mtwy. 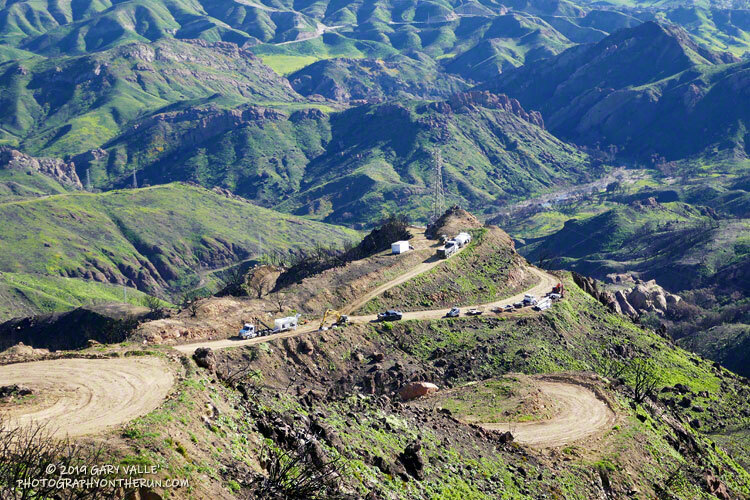 View of the work site from higher on Bulldog Mtwy. 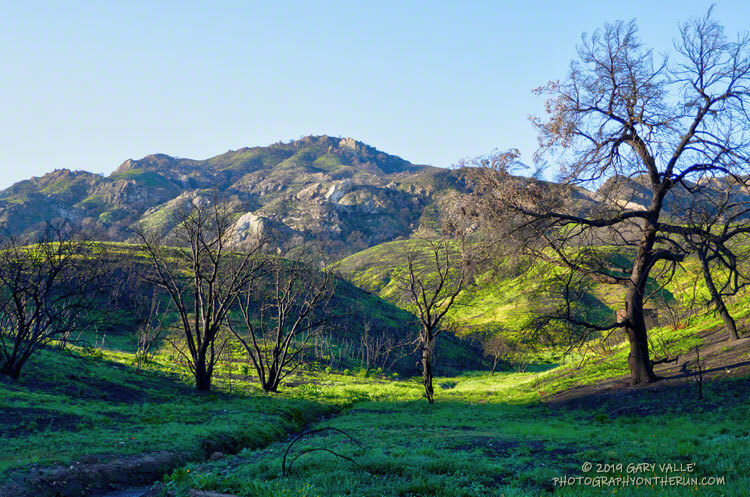 Generally, the hills held up well to Winter rainstorms. 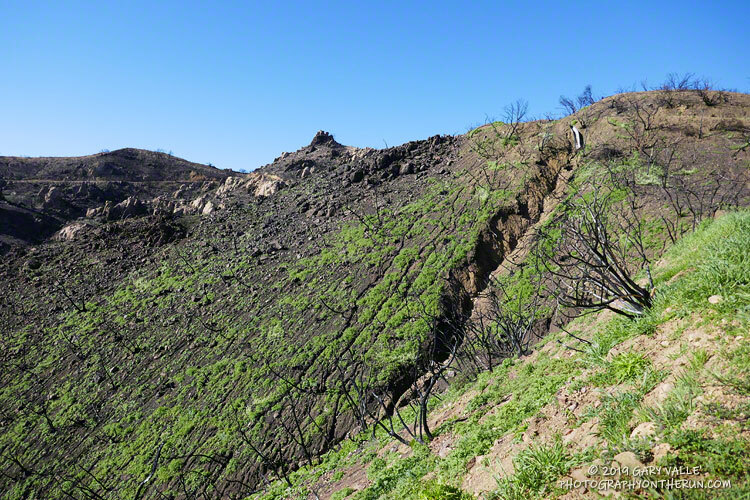 There was minimal additional erosion of this slope since late December. Rocks along Castro Mtwy near the top of the Bulldog Mtwy. 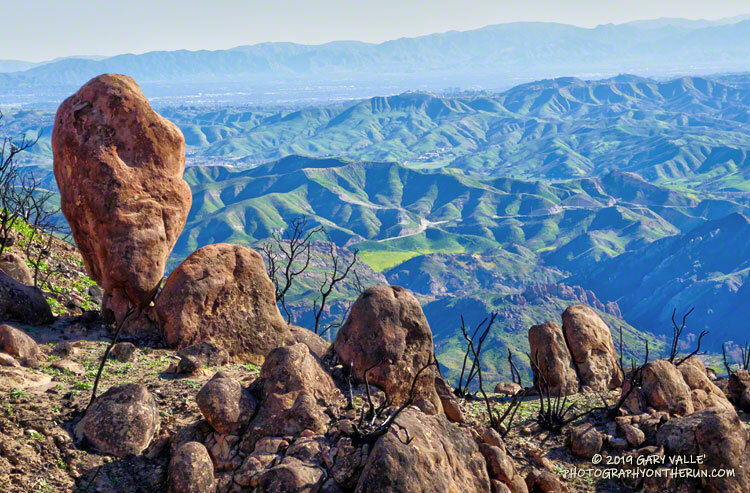 Rock formation along the Backbone Trail near Corral Canyon. 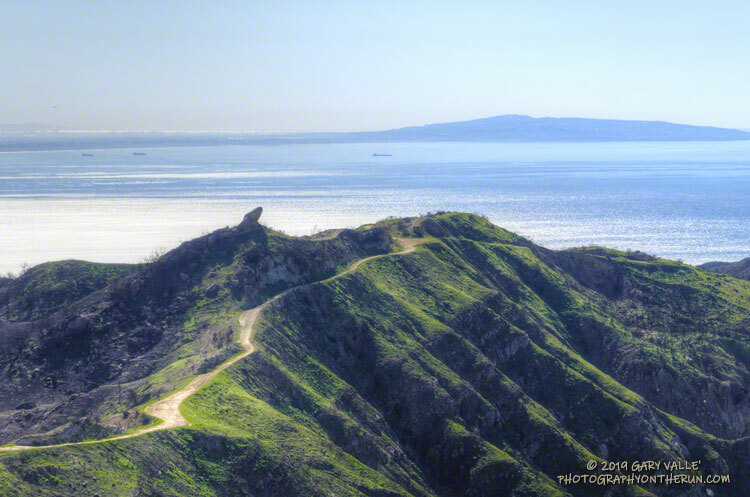 Catalina Island is in the distance. 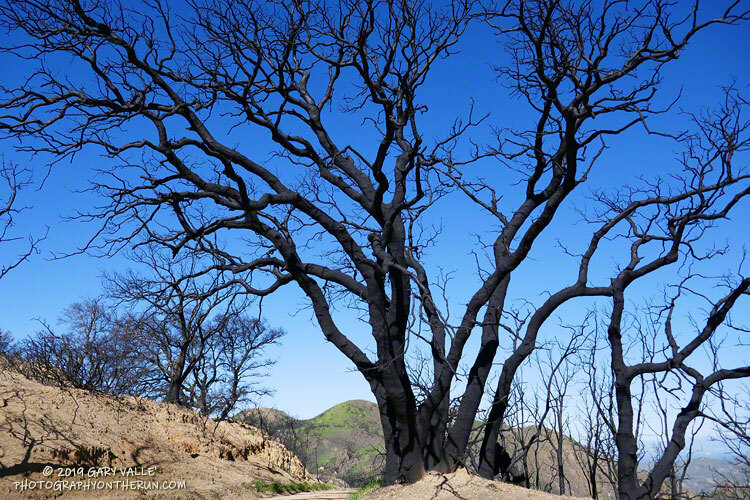 This severely burned live oak along Mesa Peak Mtwy may still generate epicormic sprouts along its trunk and limbs. A nearby tree has just started this process. March 16, 2019. 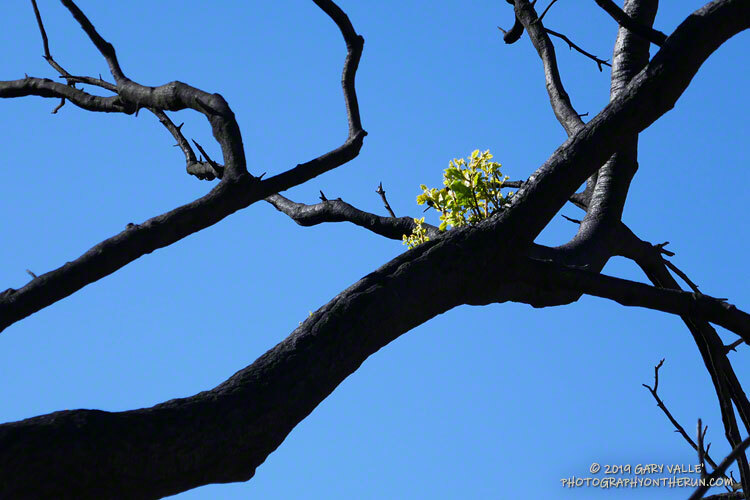 An epicormic sprout on a badly burned live oak along Mesa Peak Mtwy. March 16, 2019. 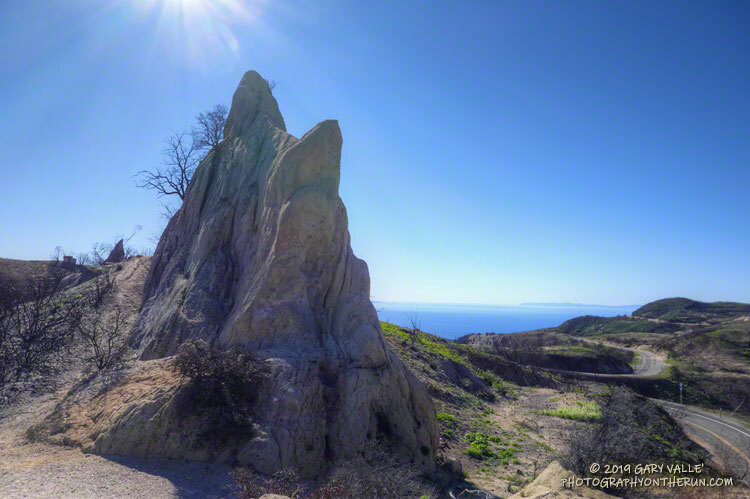 Mesa Peak Mtwy with Palos Verdes Penisula in the distance. 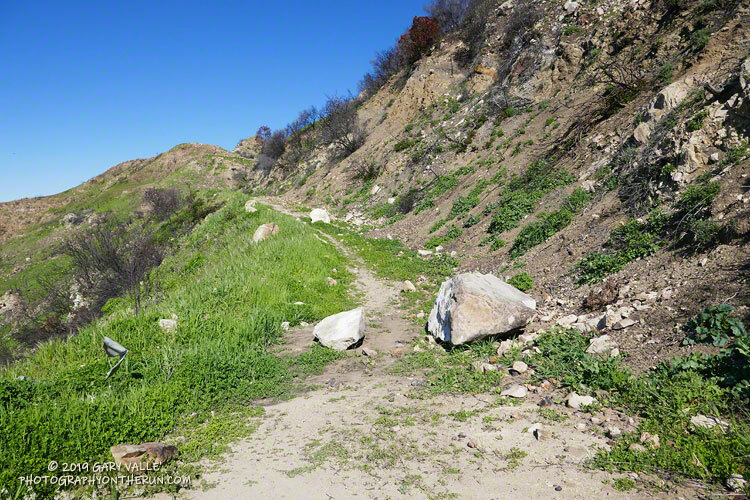 New (since late December) rockfall along Mesa Peak Mtwy. March 16, 2019. 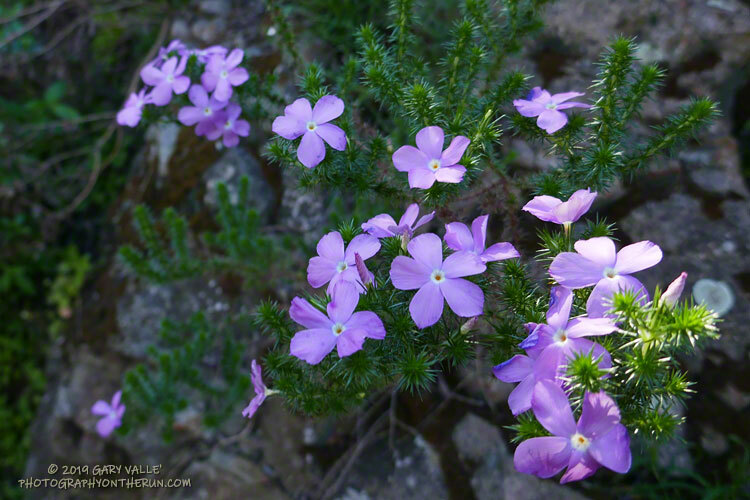 Prickly phlox along Mesa Peak Mtwy. March 16, 2019. 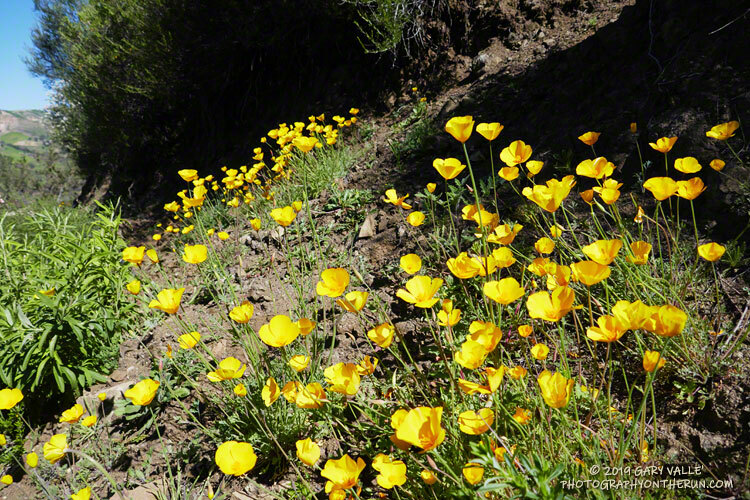 Collarless California poppies along the Tapia Spur Trail in Malibu Creek State Park. March 16, 2019. 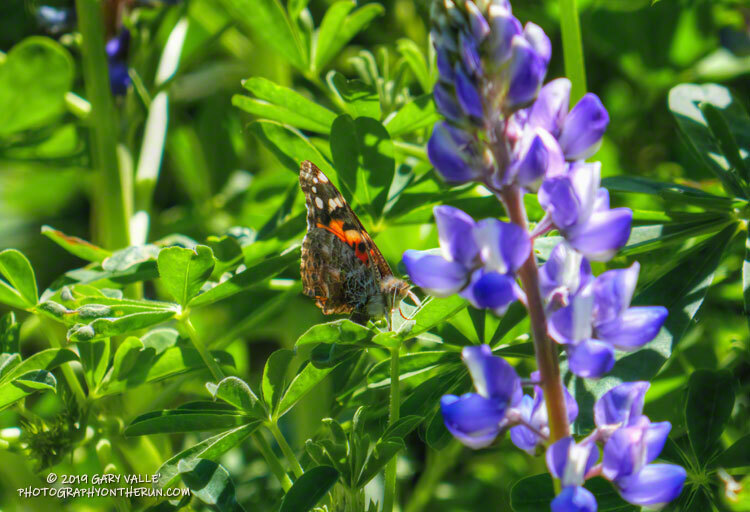 One of a multitude of migrating painted lady butterflies. March 16, 2019. 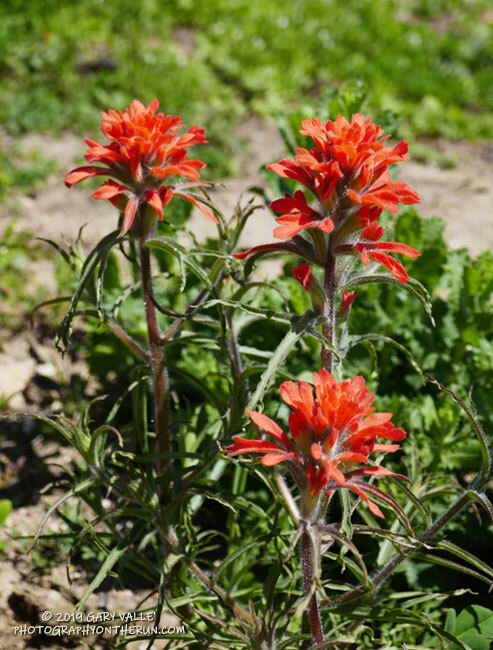 Paintbrush along the Lookout Trail in Malibu Creek State Park. March 16, 2019. 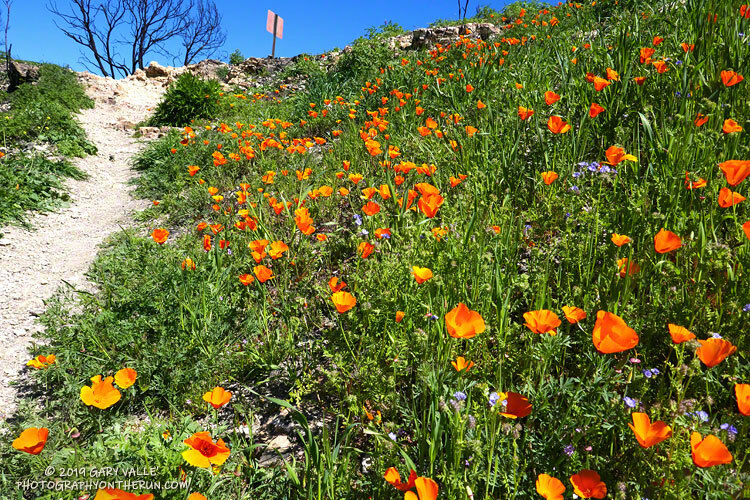 California poppies along the Lookout Trail in Malibu Creek State Park. March 16, 2019.